Welcome to the first issue of Capitol Action News for the 86th Legislative Session. The 86th Legislative session has started and our twenty-five Issue Chairs are ready to follow the bills that we are interested in. It sounds like the House and Senate are ready to work together to address financing Public Education, which is also one our our priority issues. This year we will have One-Click Action Alerts, so watch this space for items we you to respond to. This week our Issue Chair for Redistricting, Stephanie Swanson, needs us to contact our legislators to ask for their support for any redistricting bills. Our three Priority Issues are Voting Rights/Election Laws, Financing Public Education, and Women’s Health. We will always have links to their web pages/blogs, and we will also have links to other Issue pages that have timely articles and bill lists, so check out any or all that you are interested in. For those of you who are new to the Texas Legislature, check out the Beginners Guide to the Texas Legislature webpage from KUT. Do you want to fair and representative legislative districts in Texas? Please call or write your legislators to urge them to support a bill to establish an Independent Redistricting Commission. Check out Redistricting/Census Issue Chair Stephanie Swanson's blog on the League Advocacy webpages and click here to send a message to your legislators. Share the League's Take Action! video. Click on the link, then hit the "Share" button. Share to your favorite social media channel. Or click copy and paste to an email to all your friends. 3. Study Up on Key Issues! 4. Good Texas Citizens' Action! Keep up with news from the Capitol with the Texas Tribune or the Texas Standard. Sign up for the Texas Legislature Online (My TLO) to follow your area of interest and get alerts about any bills that are filed. Click on the links below to learn more about our priorities for this session. The following Issue pages have remarks about the new session and some of the early filed bills they are watching. Check them out! Behavioral Health - Issue Chair Alissa Sughrue (Austin Area) highlights the relationship between maternal mortality and behavioral health. Child Abuse - V'Anne Huser (Lavaca County), Issue Chair, delineates 3 areas of bills that have been introduced regarding child abuse: punishment for crimes against or involving children, directives for child protective services, and good faith reporting of child abuse. Child Health - Issue Chair Celia I. Kaye, MD, PhD ( LWV Collin County), reports on TExas' high rate of uninsured, as well as children affected by gun violence. 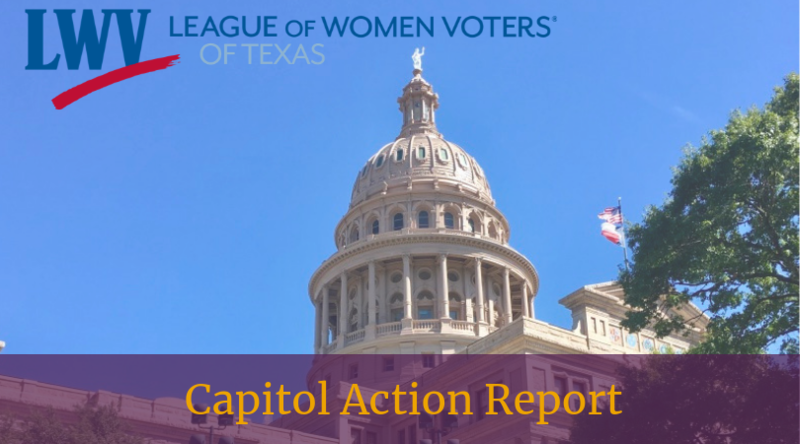 Domestic Violence - V'Anne Huser (Lavaca County), Issue Chair notes bills related to problems with evidence handling in sexual assault cases and protective orders. Financing State Government - Find out how much money is available for the Texas Budget from Issue Chair Ernie Wittwer (San Antonio Area). Judicial Selection - Issue Chair Julie Lowenberg (Dallas), posted a review of judicial selection. Land Use - Eminent domain, flood control & planning and appropriations & planning for the Texas Parks and Wildlife Department are the key issues that Issue Chair Jensie Madden (Comal) is tracking. Open Government - Working with partners in coalition to introduce new provisions that strengthen Texas’ Sunshine Laws and improve public oversight is the focus of Issue Chair Linda Pavlik's (Tarrant County) work in this area. LWVTX President Grace Chimene caught up with Linda in Austin for this week's Capitol Action Minute video. Transportation - Issue Chair Britin Bostick (Austin) is tracking the almost 200 transportation bills have already been filed! Toll roads, drivers' licenses, vehicle and trailer registrations, child safety seats, memorial highways, and the creation of regional transportation authorities are all on the list. 19 - Check to see if your community is having a Women's March.